This supplement is 55 pages long, 1 page front cover, 1 page editorial, 1 page ToC, 1 page SRD, leaving us with 51 pages of content, so let’s take a look, shall we? 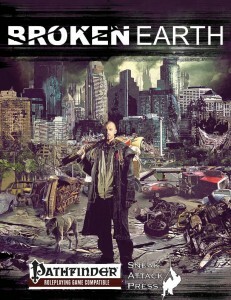 So what is Broken Earth? It is, essentially, a post-apocalyptic setting on our very own planet earth – the Great War has passed, and now the world is changed. Thus, one can assume a bunch of differences from traditional Pathfinder fantasy campaigns. So let’s skip the basic introduction and its flavor for now and focus on the options available for character generation, shall we? First of all, it is recommended you use hero points as per the APG – why will become more evident later. First of the “new races” would be the freaks – changed by radiation and genetically-engineered viruses, these beings get +2 to an ability-score of their choice, +20 to fort-saves against radiation (and no auto-fail on a natural 1), +4 to saves versus diseases and poisons and +1 to AC. Simians would be just the race for fans of “Planet of the Apes” – these mutated, upright walking intelligent chimpanzees get +2 to Str and Dex, -2 to Int, low-light vision, a climb speed of 20 ft., +2 to acrobatics (and acrobatics and climb are always class skills), are never prone as a result from falling (and get +1 to CMD versus trip) and finally, receive improved initiative as a bonus feat. If you’d rather go for a synthetic lifeform, the synths would be your race of choice with +2 Con and Int, -2 Cha, increased natural healing, 25% chance to negate crits, 10 ft. less falling distance for means of damage, +2 to two skills (which become class skills) and +4 to skill-checks when dealing with AIs. All right, that out of the way, let’s take a look at classes – and here you’ll get a minor shock: No divine and arcane magic. None. That means only the barbarian, fighter, monk and rogue are available. This also means no Knowledge (arcana), Use Magic Devices etc., but Knowledge and Craft get some new subcategories. But before delving deeper into that matter, I feel obliged to note that barbarians get two new rage powers – one making him/her resistant to radiation, while the other grants a raging barbarian a RADIATION AURA. Yes. This is awesome. Fighters may opt for the waste warrior archetype, which essentially takes handguns and long arms into account as weapon categories, Living Weapons, i.e. Broken Earth’s monks, become immune to radiation and also can actually temporarily fly at 12th level by virtue of their ki! In a world sans magic, rather awesome! Rogues of the Scrapper archetype can wilder in chemistry and psionics. Wait…yep, alchemists are represented via the Chem-heads, who use chemistry instead of alchemy. Their extracts can be injected, transmitted via patches etc. Discoveries, appropriate extracts etc. are covered in this section as well. Cavaliers remain unchanged, whereas gunslingers (here known as boomers) also get a minor modification. Now I’ve already mentioned psionics – and yes, this setting actually integrates Dreamscarred Press’ superb psionics-rules, though once again, limitations to maintain the world’s integrity are mentioned. In even more cool cross-3pp-support, Kobold Press’ great Spell-less ranger and Rogue Genius Games’ superb Anachronistic Adventurers are also mentioned, even giving a nod towards the Warlords of the Apocalypse book in planning, even though that might be considered direct competition. Superb sportsmanship and camaraderie from Sneak Attack Press here – two thumbs up! As mentioned, we get new skills – two to be precise: Drive and Pilot and they do just what you’d expect them to. 10 new feats allow you to shoot burst fire, double tap with semiautomatic firearms, gain mutations, radiation resistance, affect vermin with your psionic powers, get subdermal blades as a synth, create super drugs or drive surface vehicles sans penalty. We also get a trait for a minor mutation and 9 traits assigned to 3 locales, usually offering additional starting equipment and also offering minor bonuses. We also are introduced to a new anti-radiation formula and 4 new psionic powers that deal with radiation and technology. After this, we are introduced to the 3 sample communities mentioned among the traits, offering unique perspectives and flavor -from the primitive Axe Tribe to the Iron Shelter and the prosperous Wright Town, each gets a full-blown settlement statblock, interesting background info and even local slang – awesome. What about gear? Well, to cut a long ramble short – there is A LOT of gear in here, including different tech levels and a re-examination of the basic firearm rules and proficiency availability. The concept of item rarity and proficiencies with exotic weapons like flame throwers are covered here as well as rules for autofire. Tons of weapons and items as well as rules for weapon accessories and yes, even ammo weight, are provided, as are various super-drugs. Beyond these, we also get 8 new vehicles to pilot with the drive skill, from bicycles and canoes to SUVs and harleys – a nice array, which btw. also includes fuel efficiency. It should be noted that Broken Earth presumes trade points as an abstraction for the relative value of items, allowing you to easily convert from gp-values. Oh, and there are mastercraft items, which, in the absence of magic, work as more varied degrees of superior manufacture. The gear out of the way, next up would be rules for varying degrees of radiation sickness, overland hexploration/overland travel rules, harvesting and scavenging according to the item’s respective rarity. Where the pdf starts shining excessively would be in the settlement construction rules, which not only greatly expand those provided in the glorious Ultimate Campaign book, it also offers equivalents of titles and a total of no less than 64 (unless I’ve miscounted) buildings, all with BP and lots, allowing you supreme construction options to create your own settlement and essentially run survival-themed kingmaker games in the post-apocalyptic wasteland. Better yet: Community-events are covered in similar, massive detail and even mass combat army resources are part of teh deal here – glorious! Editing and formatting are good – while I did not notice any significant glitches, some minor typos have crept in – though nothing too serious can be found glitch-wise. Layout adheres to a printer-friendly 2-column b/w-standard with neat b/w-artworks that thematically fit the setting’s flair. The pdf comes fully bookmarked for your convenience. Matthew J. Hanson delivers a dauntingly conservative post-apocalyptic setting that comes alive surprisingly well thanks to the absence of magic – instead of trying to be too wide, the setting is narrow, concisely made and shows significant awareness for what’s out there, allowing you to make use of all those cool rulebooks you have gathered without explicitly requiring you to do so. The Broken Earth Player’s Guide is a massive post-apocalyptic toolbox, a supplement that works as a great introduction to the setting and its possibilities. Broken Earth is well-crafted and the book manages to make me excited to try for a settlement-building “stem the tide”-scenarios and more secrets on the DM-side about the world. And that is the hallmark of a good supplement. My final verdict will hence clock in at 5 stars, missing the seal of approval only by a tiny margin. You can get this damn cool post-apocalyptic book, not only useful for Broken Earth, here on OBS! If you prefer Savage Worlds as a rules-set, here’s the Savage Worlds-rules-version!